What Does It Mean to Be Past Due on an Account? When it comes to your credit card account, a "past due" account status isn't a good thing. The longer your account is past due, the worse it is for your account standing and your credit rating. What Does Being Past Due Mean? When an account is past due, that means no payment was applied to the account as of the last payment due date. Your account technically becomes past due the day you miss a payment. The account remains in past due status until you make the required minimum payment to bring the account current. Once your account is past due, you can be charged a late fee, have your interest rate increased, or lose your ability to make purchases on your account. With a rewards credit card, you could lose all the rewards you've earned to date. A past due status can apply to any account that requires regular monthly payments that must be made by a specific date. Even though your account can become past due the day you miss a payment, you have time before it affects your credit rating. Your credit report won't show that your account is past due until your payment is 30 days late. Once the past due status is reported to the credit bureaus, that's when it will affect your credit score. The tardier you become, the more it hurts your credit score. At 180 days (or six months) past due, your credit card will be charged off. You won't have the option to catch up on the amount due balance and resume regular minimum payments. Instead, you'll only have the option to pay the balance in full. And, your credit card issuer may assign or sell the account to a collection agency for further collection. Also, you may be charged a late fee each month that you're past due. Because these fees add up quickly, the longer you go past due, the more it will cost you to become current on your payments. After you're 60 days past due on your credit card account, your lender can increase your interest rate to the highest penalty rate. In some cases, the penalty rate can remain in effect for any new balance even after you've paid off your account current. Some lenders allow a payment grace period beyond the due date during which time your payment can be received without penalty. 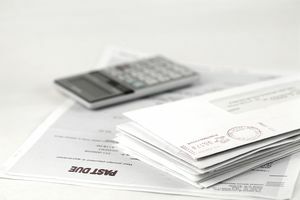 For example, if your payment is due on the fifth of the month and you have a 10-day grace period, you’ll be considered past due on the fifteenth of the month. It's worth noting that this is different from the credit card grace period that gives you a chance to avoid interest charges by paying your balance in full. What's Included In a Past-Due Amount? Your credit card statement includes a past due amount. That amount will be much higher than your regular monthly payment depending on how past due your account has become. The past due amount is a sum of the minimum payments you've missed plus late fees that have been added to your account since your last payment due date. This is the amount you must pay to make your account current again. You can bring your account out of its past due status by paying the minimum payment plus any late fees and interest that you've accrued. Once you've paid the past due balance, you'll stop accumulating late fees. Your credit card issuer will report a "current" status to the credit bureaus for that month moving forward. If your credit card issuer raised your APR to the penalty rate, it will return to the regular APR after you've made your next six payments—on time. If you can't afford to pay the full amount required to bring your account current, talk to your creditor or lender about payment options. Your credit card issuer may be able to offer a payment arrangement that will make it easier to get your account out of the hole. Some lenders can apply forbearance to your account and add the past due amount to the balance of your loan and bring you out of past due status.